I decided to use the leftover backing for the binding and did it all by machine. The Seed Packet quilt in progress is on the design wall so I'll have to wait another day or two to take a photo of the finish. A little peek at the binding finish on the back....stitched next to the binding on top to catch the fold of the binding on the back. There are a few wobbles here and there but 2 hours machine stitching vs. 8 hours hand stitching..no contest on this quilt. 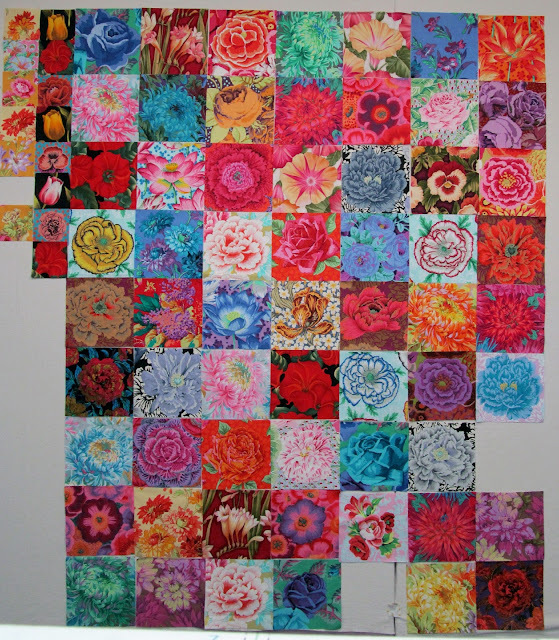 I cut eight more flower squares yesterday. I need to rearrange after I get the last two squares cut. 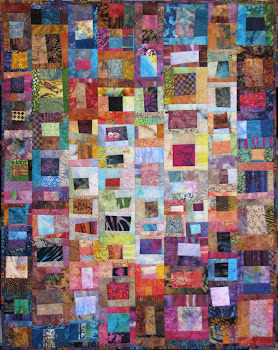 I'm impressed but not surprised that you can cut all the blocks you need for the seed packet quilt right from your stash. I've been sewing on bindings by hand. Part of one to go, plus a hanging sleeve, and I'll have finished the quartet of quilts I plan to give to the members of my sister's family for Christmas. Whew! 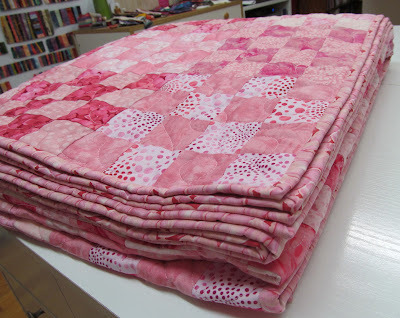 love your pink quilt - one day I need to practice doing the binding all by machine. The Seed Packet flowers are looking very good! 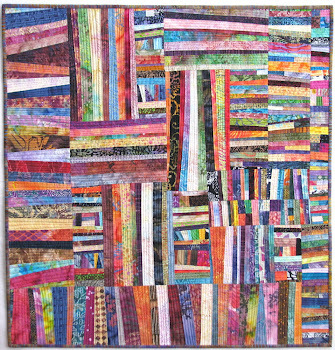 This quilt needs a good stash like yours to come to life. Just watched your wonderful video of your gallery exhibit. Gorgeous works Wanda. And a question please, do you sell your works and smaller works, like the mug rugs online? 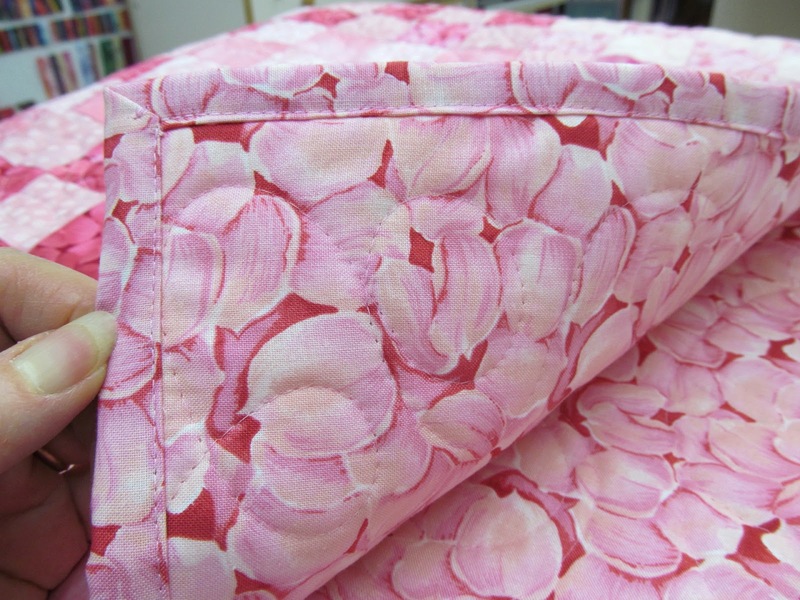 I have never been able to achieve a nice-looking machine sewn binding. Always so many places where the binding is not caught in the stitching and it looks horrible. Yours is so beautiful. Continually amazed at how much you get done, Wanda!! You did a great job on the machine binding. That's a skill I have yet to master. Beautiful! Your work and images are so uplifting. Thank you for sharing! I never thought I liked pink, but I can't help it: when I look at this pink quilt, I get so joyful that my eyes water. Very sweet pink quilt! Seed packet quilt is only getting more exciting as it grows! Congratulations on another finish! The pink quilt turned out beautiful!